Mmm… pie. That perfect fall treat. Nothing beats a slice of pie and a cup of coffee, no matter what time of day. So we asked you to crown Everett’s best pie, and you did! Let’s find out who the winners are. The Totem Diner is a great place to relax at the end of the day with slice and a cup of coffee (with unlimited refills!). They’ve been in business since 1953, and for good reason. Their pies rotate often, so check in with a server to see what flavors are on the menu. We totally ate there and filmed it, too. The Sisters Restaurant has the lunch game on lock. Lines out the door, the whole thing. Is it worth it? Oh yeah. And their pies are worth the wait, too. From traditional apple and pumpkin to coconut cream and something called a lemon chess pie, Sisters has you covered. Be sure to call ahead to skip that line we wrote about and get some VIP pie treatment. Hands down the New Mexicans obliterated the competition in the voting. Readers really love their pie! And all of the pies at the New Mexicans are delicious and of the cream variety—banana cream, coconut cream, Reese’s peanut butter cream… if you have a sweet tooth, this is the place. Next up we're voting for Everett's Best Neighborhood bar. 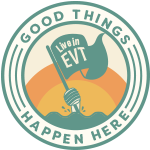 Make your vote count and vote in this month's EVVY Awards!